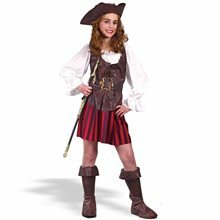 High Seas Pirate Buccaneer Child Costume.Includes: Dress, Belt, Bandanna, Hat and Boot Tops.Available Size: Girls - Small (4-6), Girls - Medium (8-10), Girls - Large (12-14). 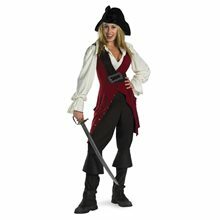 *Sword and Shoes Not Included.Material: Dress/Bandanna - 100% Polyester; Hat - 50% Polyester, 50% Plastic; Belt - 100% Pleather; Boots: 55% Polyester, 45% Foam.This lovely pirate lassie will definitely make you walk the plank! She'll sail through her next costume party in style! The great costume includes a white, red and brown polyester dress with attached vest, hat, belt and boot tops. Guaranteed to be the prettiest pirate this Halloween! Rockin Skull Pirate Teen Costume.Includes: Tutu dress, bandana, fishnet sleevelets, and footless tights.Available Size: Teen - Junior (0-9). (See Size Chart For More Information)*Shoes Not Included.Rockin' Skull Pirate Teen Costume includes drop waist tutu dress, bandana, fishnet sleevelets, and footless tights. One Size Junior 0-9.